A radiant portrayal of one of the most remarkable friendships in American letters—between the elusive, original poet and the radical abolitionist, reformer, and writer whom we have to thank for the publication of Emily Dickinson’s poetry. Brenda Wineapple re-creates the extraordinary, delicate connection between these two wildly dissimilar personalities, giving us new insight into the correspondence between them, which lasted almost a quarter of a century, a correspondence that included nearly one hundred of Dickinson’s dazzling, unseen poems. We see how Colonel Thomas Wentworth Higginson, in his dual role as friend and literary adviser, counseled her against publishing, suggesting that her poetry was too unconventional, defiant, and unpredictable. And we see how, after her death, he himself coedited the first editions of her poetry—changing her distinctive punctuation—and watched them become immediate bestsellers. Emily Dickinson and Thomas Higginson met face-to-face only twice (“I never was with any one who drained my nerve power so much,” he said), but Wineapple makes clear that their friendship nonetheless throws a brilliant light both behind the hidden door of the poet’s nimble imagination and into a corner of the noisy century that she and Colonel Higginson shared. 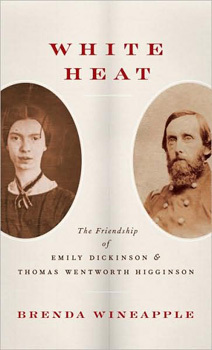 White Heat is a book about poetry, politics, love, and commitment; it is, as well, a story of seclusion and engagement, isolation and activism—and the ways in which they were related and separate—in the roiling America of the nineteenth century. Read the Publishers Weekly interview with Brenda Wineapple. Read the Boston Globe interview with Brenda Wineapple. Listen to Diane Rehm’s NPR interview with Brenda Wineapple. Watch an interview with Brenda at the Pritzker Military Library.